part of a cell that contains genetic information. except for sperm and eggs, all human cells contain 46 chromosomes. An illustration of chromosome, with its parts. (1) Chromatid. 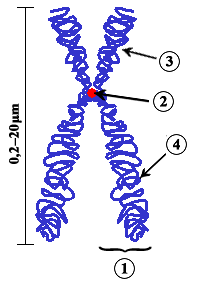 One of the two identical parts of the chromosome after S phase. (2) Centromere. The point where the two chromatids touch, and where the microtubules attach. (3) Short arm (4) Long arm. 19th century: from German Chromosom, ultimately from Ancient Greek χρῶμα (khrôma, “colour”) + σῶμα (sôma, “body”) (because they are stained under the microscope). (cytology, genetics) A linear arrangement of condensed DNA and associated proteins (such as chaperone proteins) which contains the genetic material (genome) of an organism. chromosome in Webster’s Revised Unabridged Dictionary, G. & C. Merriam, 1913.
chromosome in The Century Dictionary, New York, N.Y.: The Century Co., 1911.